Susan Fleischmann is a photographer who has worked on behalf of community-based media and television in Cambridge since 1976. She graduated from New England School of Photography with an Associates Degree in 1976 and a BA in Media and Women's Studies in 1981 from University of Massachusetts, Amherst. 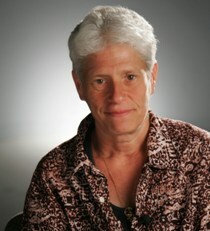 In the academic year 1999-2000, she was a fellow in the Center for Reflective Community at MIT. She has documented social action movements, including the women’s movement, as photographer and videographer as a free-lance photographer from 1976 to 1988. Her photographs regularly appeared in Gay Community News, Off Our Backs, and Equal Times. She began as a media arts activist when the cable franchise hearings were held in Boston in 1981. From the time that Cambridge Community Television (CCTV) opened in 1988, she joined the organization and served at first as Access Manager. In 1993, she was made Executive Director and since that time has been an articulate leader, diversifying the channel’s funding base, expanding the access of the public to diverse media and technologies by opening a computer lab and an arts gallery, the Drive-by Gallery. Under her management, CCTV won “Overall Excellence in Public Access Programming” six times in the past fifteen years in the Hometown Video Festival sponsored by the national organization, Alliance for Community Media, most recently in 2008. Fleischmann has won a number of awards for her photography and more recently as Person of the Year from TAB Community Newspaper in 1998. The Cambridge Lavender Alliance awarded her a Community Recognition Award in 2003, and CCTV recognized her with an award in 2008. References: Personal information; biographical information in Susan Fleischmann, “TV Station: How To Create An Award-Winning Public Access Station”. Be the Media, Online book, http://www.bethemedia.com/tableofcontents.htm. Gladys Friedler, called “Gaby” by her friends, was born in Lewiston, Maine to Anna and Max Herman Friedler. After attending the Lewiston public schools, she received her Bachelor’s degree from the University of Maine; her master’s degree from the University of Pennsylvania and her PhD in Medical Sciences from Boston University in 1968. She went on to do postgraduate work at University of California San Francisco Medical Center (UCSF) and then returned to the Boston area with a research fellowship at Harvard Medical School from 1970 to 1972. From 1972 until 1999, she was an Associate Professor of Pharmacology and Psychiatry at Boston University Medical School. She was one of the first to study paternal effects of various drugs on the fetus. In her research on rodents, Friedler pointed out that exposure "can induce long-term changes in the normal developmental and behavioral patterns of subsequent offspring” of males exposed to addictive and therapeutic drugs, environmental toxins, and alcohol. (“Paternal Exposures: Impact on Reproductive and Developmental Outcomes. An Overview. Pharmacology Biochemistry and Behavior 55(1996) 691-700). She received national attention in the media when she organized a session “The Father and the Fetus” in March 1991 at the AAAS meeting in Washington, DC. Since that time, her work has been often cited as ground-breaking. She was awarded a Bunting fellowship at Radcliffe in 1991 and has remained active in that organization. She is presently professor emerita at Boston University. A skilled singer, Gaby Friedler sang folk songs in the cafés of Cambridge in the late 50s and continues to sing with choral groups in Cambridge, Arlington, and Woods Hole. She has been politically active in the life of Cambridge throughout her residency in the city. References: Karma Kitaj Women Who Could . . . and Did: Lives of 26 Exemplary Artists and Scientists. (2002); Cynthia R. Daniels, ”Between Fathers and Fetuses: The Social Construction of Male Reproduction and the Politics of Fetal Harm.” Signs, Vol. 22, No. 3 (Spring, 1997), pp. 579-616; (reprinted in Women, Science and Technology: A Reader in Feminist Science Studies Mary Wyer (ed.) 312-331.(2001). ; Cynthia R Daniels. Exposing Men: The Science and Politics of Male Reproduction. New York (2006). Mary Hamilton Frye was born in Salem, Mass. on April 18, 1890 to Nathan Frye and Alice H. Chase Frye. She had three brothers Charles, Francis, and John. The family moved from Salem to Cambridge around 1896. They lived for many years at 10 Acacia Street in Cambridge. Miss Frye attended the Boston School of the Museum of Fine Arts and was a member of the Boston Society of Arts and Crafts. In her early twenties, she illustrated children’s books, including the Wonderful Adventures of Nils by Swedish author Selma Lagerlof. She was a friend of New Hampshire painter Maxfield Parrish. She exhibited with the Cambridge Art League and the Boston Society of Arts and Crafts. Frye's art career evolved into designing and creating stained glass windows. She studied in London with the English stained glass artist Christopher Whall and in Boston with Charles Connick. She opened her own stained glass studio on Church Street in Cambridge in 1920. She designed stained glass windows for churches in Yarmouth, Nova Scotia and Mechanicsville, New York. Locally, she designed windows at Bertram and Eliot halls in the Radcliffe Quadrangle. Frye moved from Cambridge to Concord, Mass. in 1949 and worked at the Boston Museum of Science as an artist. She died of breast cancer at the age of 61 on May 18, 1951 and is buried in Sleepy Hollow Cemetery in Concord. References: Nomination by Robin Hein. Cambridge newspapers. Born to Timothy and Margaret (Crane) Fuller in 1810, Sarah Margaret Fuller grew up in Cambridge. Her father gave her a very thorough education in Latin and world literature. She studied at a girl’s school in Groton and continued her education at home and at Mr. Perkins school where she learned Greek. By her late teens, she was considered a prodigy and made early friendships with a number of young Harvard men who later joined the Transcendentalist movement inspired by Ralph Waldo Emerson. Her father died when she was in her mid twenties and she began to teach in Boston at Bronson Alcott’s Temple School, where she met her fellow teacher and activist, Elizabeth Peabody. By 1839, she had moved to Jamaica Plain and began to work closely with the leaders of the Trancendentalist movement, offering “Conversations” to interested men and women on topics that ranged from women’s rights to philosophy. She also joined Emerson in editing and writing for the Transcendentalist journal, The Dial. In 1844, she moved to New York to write critical essays on literature and art for Horace Greeley’s newspaper, the New York Tribune. During this period, she published her most influential book, Woman in the Nineteenth Century (1845). Two years later, she was given the opportunity to travel to Europe as the Tribune’s foreign correspondent. Margaret Fuller. Image created between 1840-1880. In England, she met many famous literary men and women and the Italian exile and republican revolutionary, Giuseppi Mazzini. She traveled on to France and then to Italy where she met her future husband, Giovanni Angelo Ossoli who was a friend of Mazzini and, like him, involved in the republican movement that overthrew the government in Rome in 1848. Fuller also dedicated herself to this revolution, and married Ossoli only after the birth of her son. During this period she worked closely with her husband, taking supplies to his unit and organizing an emergency hospital during the siege of Rome by the French. After the overthrow of the Italian republic in July of 1849, she fled to Florence with her husband and son and began to write a history of the Italian revolution. The family took passage on a ship sailing to New York in May 1850, but the ship floundered in a storm near Long Island and all three Ossolis perished. Her body and her manuscript was never found. A memorial tablet was erected in Mount Auburn Cemetery to her and her husband near the burial of her child, whose body was the only one recovered from the shipwreck. Margaret Fuller's family home in Cambridgeport (built 1807) is located at 71 Cherry Street and was converted for use as a neighborhood settlement house in 1902. The Margaret Fuller Neighborhood House is still actively serving the local community today, assisting over 1,500 people each year with educational, support, outreach, and community services.